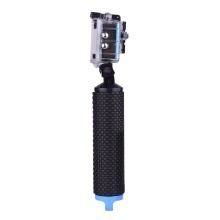 Float Hand Grip for Gopro Go Pro Hero 5 4 3 Xiaomi Xiomi Yi 2 4K 4 K Action Camera, Non-slip handle with silicone surface, delivers tight grip and extra comfort. This wrist strap can be freely adjusted to the size you need. Perfect for photography during deep sea diving, snorkeling, scuba diving, swimming, surfing and other water sports activities. The grip stabilizer provides easy aiming and allows you capture a variety of angles with increased stability and control. Compact size, lightweight and portable, can put it in your back pocket, backpack or case for wherever the journey takes you. The floating body of the handler will keep the camera and other accessory on the water surface and prevent it from drowning. Note: This grip need to use with clip and waterproof case.